Imagine designing a fantastic new luminaire. Suddenly a customer walks in and says; “I need that particular luminaire, but with a lens not a reflector. And the beam needs to be oval, not symmetric for this project.” What happens next? Yes, we’ve done it again with HEKLA, another great innovation from our outstanding design team. HEKLA is a versatile solderless connector that already has extensive compatibility with a wide range of our existing optics, as well as a wide number of COB LEDs. It’s robust, and the low profile design ensures constant pressure between the COBs and heatsink. We’ve made luminaire alterations with a huge range of optics and LEDs so simple it’s child’s play (even though children should absolutely not play with electricity). Are you keen on learning more? 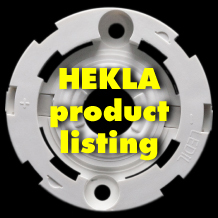 Get all the technical details by visiting HEKLA at our website. HEKLA is so cool and versatile it allows you to choose between a socket and a solderless connector with the same interface so you can decide whether or not to solder the LEDs. HEKLA sockets/connectors are robust and designed to withstand some serious heat (max 110°C) while maintaining contact between the LED and the heat sink. At Ø44 mm HEKLA is low profile and comes in enough versions to support an incredibly wide range of different size COB LEDs. All you have to do is choose the right HEKLA model for the LED you have chosen. HEKLA has industrial standard poke-in wire terminals for 0.35 - 0.50 mm2 solid wires and a bayonet interface that support a host of LEDiL product families. The standardized Zhaga 35 mm mounting holes and our continuous support for HEKLA ensures your luminaires are future-proof. Currently the compatibility list includes LEDiL’s BROOKE-G2, MIRELLA-G2, RONDA, CARMEN, ZORYA and WINNIE. SO HOW DO YOU INSTALL HEKLA STEP BY STEP? CHECK OUT OUR NEW HEKLA INSTALLATION VIDEO AND SEE FOR YOURSELF.